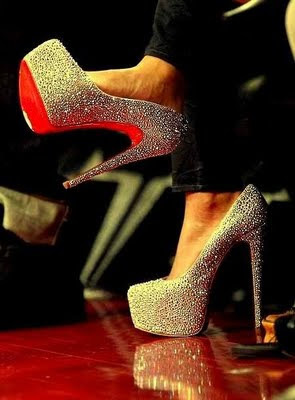 Early July, Noted Fashion Designers Christian Louboutin and Yves Saint Laurent spent time in court battling against YSL using the trademark "red bottom" sole for their 2011 cruise collection. YSL's lawyer,David Bernstein, began to enlighten the court room with a few moments in fashion that could possibly go in YSL's favor of using the trademark red sole, he argued that Yves Saint Laurent had been using red soles since 1962 (when they were founded!) and even icons throughout history, such as Dorothy from the Wizard of Oz, and King Louis XIV of France indeed wore red soles! His question for the jury as well as the judge was whether or not a Designer could monoplolise and trademark a colour. Personally, no one should be able to have power of a colour, but the bigger picture is, why now? Now that Christian Louboutin's lavish designer shoes have made such a success and gained mass popularity is it now appropriate to introduce red soles for an upcoming collection. I personally admire originality and any staples in fashion that are unique but it takes a true artist to dig deep within their artistic abilities and create the next craze- but hey that's just my opinion! Un couple louboutin pas cher chaussures peut apporter une amélioration - il peut transformer votre vie d'être juste correct dans un regard qui dit incroyable.